This stirring love story is a profoundly insightful look into the hearts and minds of three people who are at once bound and separated by forces beyond their control. An American Marriage is a masterpiece of storytelling, an intimate look deep into the souls of people who must reckon with the past while moving forward—with hope and pain—into the future. Tayari Jones is the author of four novels, including Silver Sparrow, The Untelling, and Leaving Atlanta. Jones holds degrees from Spelman College, Arizona State University, and the University of Iowa. A winner of numerous literary awards, she is a professor of creative writing at Emory University. Visit her website at www.tayarijones.com. "Novelist Jones writes brilliantly about expectations and loss and racial injustice, and how love must evolve when our best laid plans go awry." 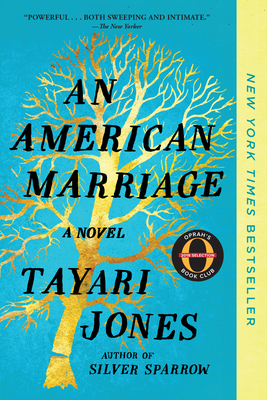 "Tayari Jones provides an essential contemporary portrait of a marriage in this searing novel. An American Marriage gorgeously evokes the New South as it explores mass incarceration on a personal level." "Powerful . . . Astonishing . . . Through the accumulation of small details, Jones paints a portrait of a nation still deeply divided along lines of race and class." "An American Marriage is a masterpiece of storytelling, an intimate look deep into the souls of people who must reckon with the past while moving forward—with hope and pain—into the future." " Breathtaking . . . Jones is a master with words and An American Marriage is the wordsmith at the top of her game." " Heart-wrenching . . . An American Marriage poses profound questions about what we owe each other, and what injustices we allow to persist." "One of America's finest writers, Tayari Jones has offered up another masterpiece with her latest novel, a tremendously powerful story about love, injustice, inequality, and strength. An American Marriage reveals how quickly dreams can be derailed due to systemic malignant forces all around us. It's a novel of vision and grace, and it will bury itself in your consciousness." "It’s always an event when there’s new writing from Tayari Jones . . . "